This recommended practice is concerned with safety practices for those who are involved with making measurements on high-voltage sources or with high-power sources of various types including power-system lines, 60 Hz test transformers, direct-voltage supplies, lightning-impulse generators, and switching-impulse generators. This recommended practice is limited to safety practices with regard to electrical hazards involved in temporary measurements, as opposed to metering, relaying or routine line work. Considerations of safety in electrical testing apply not only to personnel but to the test equipment and apparatus or system under test. 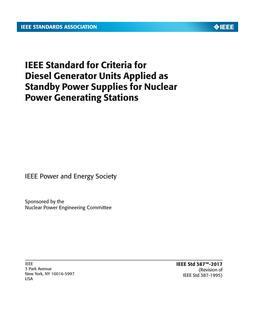 This recommended practice deals generally with safety in connection with testing in laboratories, in the field, in substations and on lines, and with the test equipment utilized. Special areas involving cable-fault location, large capacitance load testing, high-current testing, and direct connection to power lines are treated separately. For applications of high-voltage test equipment and methods in areas not specifically covered. New IEEE Standard - Inactive-Withdrawn. Safety practices for those who are involved with making measurements on high-voltage sources or with high-power sources of various types, including power-system lines, 60-Hz test transformers, direct-voltage supplies, lightning-impulse generators, and switching-impulse generators are recommended. Electrical hazards involved in temporary measurements, as opposed to metering, relaying, or routine line work, are considered. Safety is considered in connection with testing in laboratories, in the field, in substations, and on lines, and with the test equipment utilized. Cable-fault location, large-capacitance-load testing, high-current testing, and direct connection to power lines are treated separately.